Preheat oven to 375 degrees. 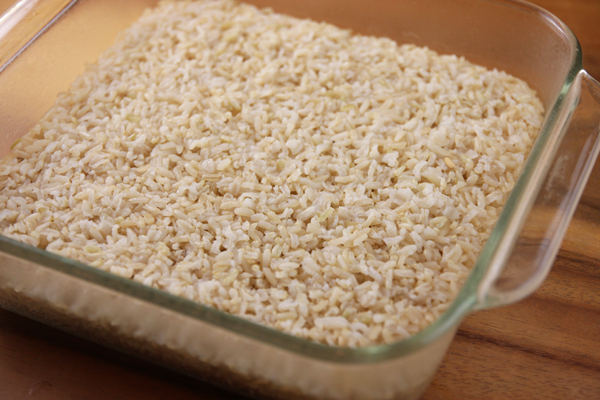 Place the rice into an 8-inch square glass baking dish. Bring the water, butter, and salt just to a boil in a covered saucepan. Once the water boils, pour it over the rice, stir to combine, and cover the dish tightly with heavy-duty aluminum foil. Bake on the middle rack of the oven for 45 minutes. Check to make sure it’s almost done and not burned. Bake for 15 more minutes. After 1 hour total, remove cover and fluff the rice with a fork. I must say that this was probably the best rice I’ve ever made. Rice can be used for a weeks worth of recipes! I made several tofu and shrimp stir fry meals! That looks so complicated! Let me know what you think of this method. this is brilliant! for all the things I cook, I always, always, always get unevenly cooked rice on the stove. It’s my cooking Achilles heel…thanks for the tip! I was pretty skeptical when I put it in the oven but was surprised that it actually worked!